Beauxis-Aussalet, E.M.A.L, & Hardman, L. (2015). 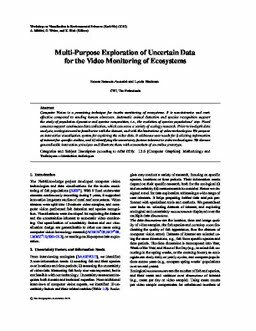 Multi-Purpose Exploration of Uncertain Data for the Video Monitoring of Ecosystems. In Proceedings of Workshop on Visualization in Environmental Sciences 2015 (EnvirVis). EuroGraphics.